There is much celebrating going on by Metro and transit expansion advocates around the region. In President Barack Obama’s proposed budget for next year, a cool $200 million is set aside for Los Angeles under the “new starts” program. $100 million of that is set to go towards the Regional Connector and the other $100 million to the Westside Subway extension. The $200 million is a record investment for the Los Angeles region and will help both projects be completed at lower cost to local taxpayers. Both projects are partially funded by the Measure R sales tax passed by voters in 2008. This is certainly good news for Los Angeles, however there are a couple of major obstacles left before Metro can start cashing these checks. The Wall Street Journal is reporting the White House budget proposal includes $100 billion in new taxes on corporations’ international operations. About $150 billion is needed to bridge the gap between gas tax revenue and projected federal transportation spending over the next four years. But even if the administration is able to somehow convince the House and Senate to pass the tax increase, there’s always a chance the budget itself won’t be able to pass the House of Representatives. It’s fortuitous that Obama and House Republican David Camp have similar plans for business tax reform, but mid-term elections often aren’t the best time for bi-partisan compromise to rule the day. The Connector and Purple Line Extension also plan to use federally-backed TIFIA loans that will help Metro get lower interest rates than if they borrowed money for construction at market rates. That’s significant because it shows the degree to which the federal government under President Obama is getting involved in helping local areas build transit. This is true, and good for President Obama. But the other big picture is that national politics seem to have a funny way of sometimes getting in the way of good local policy. 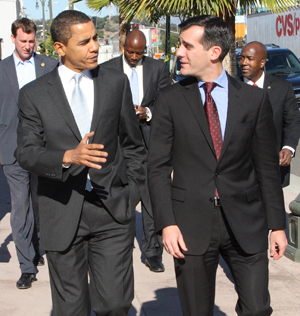 While today is a good day to thank Obama and Los Angeles’ Congressional Delegation for their work getting L.A. this far, there’s miles to go before Metro can take these checks to the bank.